To many middle class Hong Kong residents, travel means flying. Since Hong Kong is an island, there are not many opportunities to take long road trips. Cheap plane tickets, and the difficulty in arranging extended vacation time explains why a lot of people in Hong Kong are obsessed with taking short trips over long weekends. If someone takes several of these long weekend trips a year, how much carbon are they emitting? To find out, we used the WWF carbon calculator that was created specifically for Hong Kong residents. According to the calculator, my total carbon emissions for 2011 was 8.25 tonnes. Of this amount, 2.35 tonnes was due to plane travel which consisted of one business trip to Beijing and one 2-week leisure trip to Taiwan. I have no plans to do any air travel in 2012. Without the 2.35 tonnes from air travel, my carbon emission of 2012 will be reduced to 5.9 tonnes, which is lower than the 6.5 ton average per person in Hong Kong. When air travel has almost reached the status of a basic human right, you probably can come up with a hundred reasons why you are entitled to continue to do so as often as you like. To many individuals, reducing air travel seems like an infringement on their personal freedom. Reducing air travel along with reducing meat consumption are the biggest contributions we can make on personal level to mitigate climate change. However, if flying is a “necessity” for you, here are some tips you may want to consider. Having taken not a few of these weekend trips in the past, I have come to question their value. I used to go to Taipei to soak in a hot-spring and hang out in their 24-hour bookstores. I visited Bangkok for Thai massages, shopping for cheap but cool looking decorative household items, and eating some delicious Thai food. Not only does each of these trips generate tons of carbon emissions, but when you consider that you spend at least 35% of your “leisure” time in transit, is it really worth it? I am not suggesting that we should forgo air travel altogether, but can we make better use of our carbon budgets? By taking fewer longer vacations (as opposed to many shorter ones), we actually get to spend more time vacationing rather than in transit. We can give ourselves more time to get to know the local culture or even make a few local friends. Another factor to consider is that short-haul trips are more carbon intensive per mile flown than long-haul, due to the large amounts of fuel burned during take-off and landing. The plane burns less fuel when cruising. That being said, the optimal trip from a carbon emission perspective would be short in distance but long in time. I used to eat whatever the flight attendants have to offer from the trolley, chicken fried rice, seafood pasta, beef noodles, and most of the time these food made me feel depressed because they tasted so bad. A few years ago I started to order vegetarian meals on plane. The vegetarian meals have several advantages (a) your food comes first, (b) they are better quality, and (c) if you fly Cathay there are a number of tasty options such as Indian vegetarian. Not only is laundry a tremendous waste of water and electricity, but the harsh detergents and bleaches used are flushed into our waterways, causing untold damage to the ecosystem. 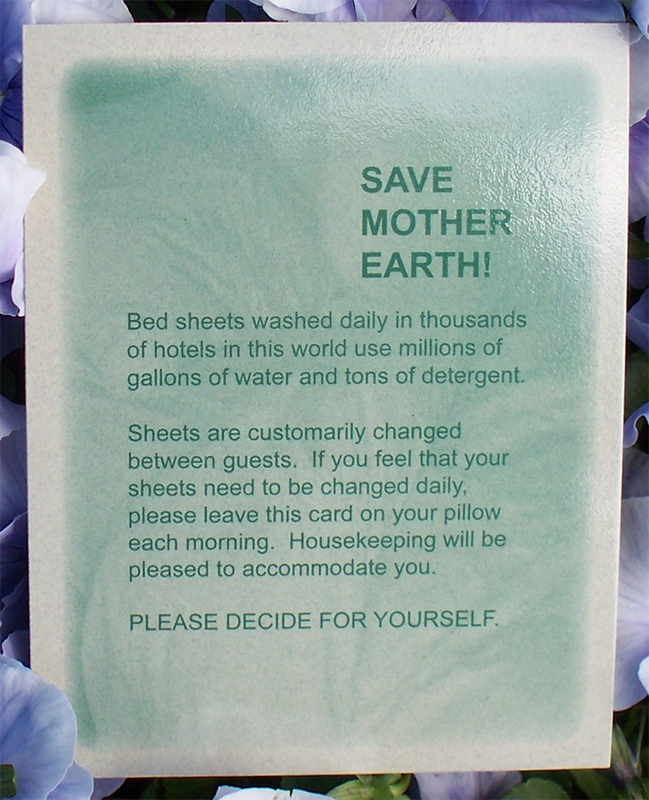 You may have noticed that these signs posted by hotel management simply don’t work. This is a form of greenwash that everyone turns a blind eye to. 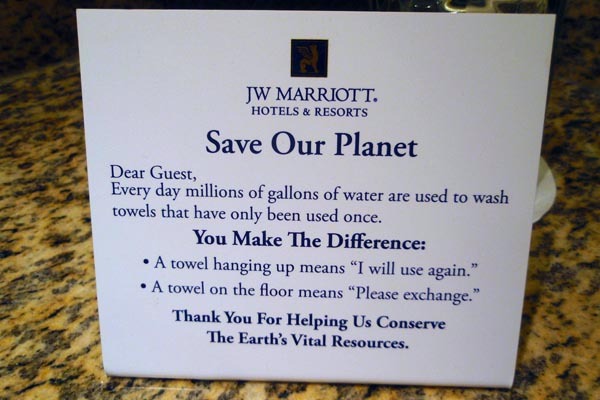 From my experience at many hotels, the staff change your towels daily even when you hang them up. So just hang the DO NOT DISTURB sign on your door to ensure the cleaning staff do not change you towel and bedding. 4. Remember to bring your own toothbrush, soap, shampoo and comb. These single use items just end up in landfills. When I used to travel, soaking in the clean, large tubs is one of the things I really enjoyed. This however wastes a huge amount of fresh water and electricity (4% of total electricity consumed is used for pumping and treating water). An average bath requires 30-50 gallons of water. The average shower of four minutes with an old shower head uses 20 gallons of water. With a low-flow shower head, only 10 gallons of water is used. Be aware of water situation in the region you’re traveling to. Areas such as Beijing and Yunnan have been suffering drought for several years and our travel should not exacerbate their problems. 6. To carbon offset or not? An area of controversy has been the use of carbon offsets. 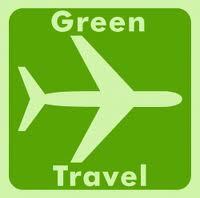 The carbon used in your trip is calculated and you buy “offsets” that reduce carbon emissions by a corresponding amount. These “offsets” are used to fund projects that can range from tree planting to providing solar stoves to peasants (so they don’t chop down trees for fire wood) to renewable energy projects. The issue with these offsets has been monitoring whether they actually achieve the reduction in carbon emissions promised. Another criticism leveled at them has been that they are sort of like buying alms from the church, in that their primary function is to alleviate our guilt and allow us to continue such behavior. It may be more effective to calculate the cost of carbon offset for your trip but then donate that money to a trusted environmental organization instead. When it’s all said and done, we as a species are facing a critical challenge – climate change – that cannot be solved by technology alone. It will require behavioral change. I have found that taking steps to reduce my carbon emission by eliminating air travel has not caused any appreciable decline in my quality of life or overall happiness. Contrary to my initial expectation, it has increased my level of happiness by causing me to seek out deeper ways of achieving contentment. Travel is inherently a superficial experience that seeks to create happiness by temporarily taking us away from the stress or boredom of our daily lives. Like shopping therapy and drugs, travel provides a transient happiness that discourages us from developing more meaningful ways to achieve happiness within our daily lives. Next Next post: Do Natural Cleaners Work?